EXECUTIVE SUMMARY: The recent round of fighting between Israel and Hamas was seemingly sparked by the exposure of an Israeli special forces team during a covert operation in Khan Yunis. The Hamas leadership, which apparently is not interested in war, nevertheless chose to respond by escalating to the very brink. Why has the Israeli government refrained (yet again) from instructing the IDF to settle the Hamas threat? The discourse that tends to swirl in the wake of events like this week’s sharp Gaza escalation generally revolves around a clichéd discussion about “the loss of deterrence.” But the gauge of deterrence, like a thermometer in a patient’s mouth, only measures a symptom; it does not explain the situation. Something deeper than “loss of deterrence” drove the event. The Hamas leadership certainly knows the strength of the IDF relative to the strength of its own forces. But it bases its decisions not on that calculation but on its assessment of the constraints that prevent the Israeli government from making the decision to go to war. 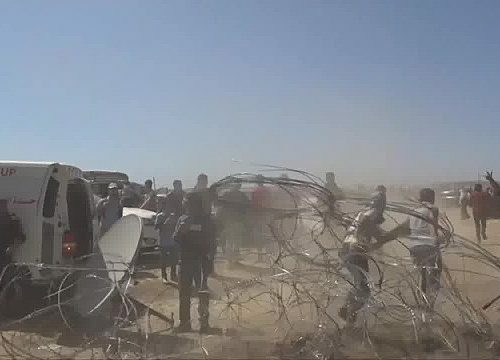 During the regular riots Hamas has led along the border since the spring, the group has learned its way through the Israeli strategic labyrinth. It understands how it can exploit the possibility of Israeli distress to advance its own interests. Hence the trap of both sides of the Israeli political map. The opposition attacked PM Netanyahu for abandoning security by restraining the use of military force against Hamas. Yet even as Israel is mired in the devastating consequences of the disengagement from Gaza, the Left continues to strive for another withdrawal in the West Bank – a withdrawal that could worsen Israel’s security situation to the point of rockets flying from Qalqiliya into the metropolitan Dan region. On the other hand, Netanyahu, who seemingly seeks refuge from the two-state solution to which he has repeatedly committed himself, has an interest in the creation of an independent Hamas state in Gaza, as PA President Mahmoud Abbas remains entrenched in his lifelong rejection of Jewish statehood. It would therefore be desirable for Netanyahu to maintain the Hamas regime. This is where the Israeli system finds itself lost in a maze. The Hamas leadership has grasped the potential of this situation and is exploiting it to the full. It is time to challenge the assumption that spatial separation benefits Israel. Supporters of withdrawal from the West Bank, including most senior members of the former security establishment, base their thinking on the belief that the attendant risks of withdrawal and territorial separation can be mitigated by the fact that the IDF’s continuous superiority can remove, within days, any security threat emanating from the territories vacated by Israel. But since the beginning of the Oslo process, something significant has changed in relations between Israel and the Palestinians, and in recent decades there has been a global change in the phenomenon of war. Supporters of withdrawal have not internalized the significance of these changes. Their assessment of the IDF’s relative strength is thus consistently overestimated. Here lie the seeds of Israel’s ideological fixation: the unwillingness to examine the extent to which separation as a strategic direction mainly helps the enemy. Looking at the Gaza Strip prior to the IDF withdrawal, we see that although there was a fence that delineated the Strip, most of the IDF forces operated within the area based on the deployment of the Israeli villages in the south of the Strip. This created flexible operational potential for the IDF forces, which could reach enemy areas from a variety of directions. For example, refugee camps in the central Gaza Strip could be reached from the north via the Netzarim enclave, from the east via the border of the Strip, and from the south via Kfar Darom and Gush Katif. The capacity for surprise, flexibility, mobility, control of the area, and freedom of action were fundamentally different from those along the current borderline of the perimeter of the Strip. The deployment of the IDF prior to the shortening of the lines in the summer of 2005 required Hamas to focus on fragmented defense efforts. The redeployment of forces and their reliance on a security fence in linear arrays made the fence a focal point for friction, and created the conditions for Hamas to organize its forces according to battalions, brigades, firing lines, and command and control systems. In this respect, territorial separation helped Israel’s enemies and harmed the IDF’s freedom of action. The standard argument among “security technicians” is that shortening the lines of engagement is beneficial for security. But this claim is not only fundamentally wrong but the inverse of the truth. Friction in a multi-dimensional inner space, as exists today in the West Bank through the deployment of Israeli neighborhoods, enables more efficient utilization and wider strategic freedom of action for all components of Israeli power. The strategic maze in which the State of Israel finds itself in the Gaza Strip offers a valuable lesson on how security interests should help formulate the IDF’s future deployment in the West Bank. In the meantime, the extent of the recent Hamas firefight requires the defense establishment to reexamine the IDF’s readiness to fight on two or more fronts simultaneously. A serious change in the conditions of the Palestinian threat from the West Bank, which would in turn intensify the threat from Gaza, is liable to disrupt the inter-ministerial agenda to the point of undermining the necessary conditions for concentrating the effort on the northern front. In these circumstances, the recently voiced aspiration of former senior defense establishment officials, including Maj. Gen. (res.) Amos Yadlin, to lead a further separation in the West Bank is worrisome. Israel’s strategic navigation right now resembles wandering through a maze without a map. As the pace of change accelerates, it needs a fully updated map. Maj. Gen. (res.) Gershon Hacohen is a senior research fellow at the Begin-Sadat Center for Strategic Studies. He served in the IDF for forty-two years. He commanded troops in battles with Egypt and Syria. He was formerly a corps commander and commander of the IDF Military Colleges. This entry was posted on November 16, 2018 at 11:01 AM and is filed under Uncategorized. You can subscribe via RSS 2.0 feed to this post's comments. You can skip to the end and leave a response. Pinging is currently not allowed.